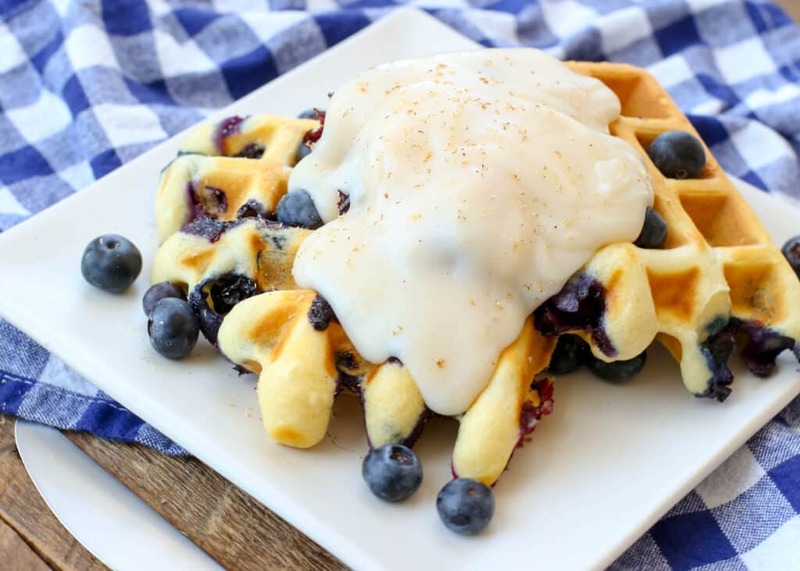 Crisp buttery waffles filled with blueberries are a breakfast treat that will have you coming back for just one more bite until they are gone. Sometimes I snack on a plain blueberry waffle, occasionally we drizzle them with maple syrup, but most often in our home Blueberry Waffles are topped with my grandmother’s waffle sauce. Blueberry Waffles with Waffle Sauce have become one of the breakfasts that I crave the most often. We’ve been pouring my grandmother’s waffle sauce over blueberry pancakes for years, but I never thought to try making blueberry waffles until a couple months ago. 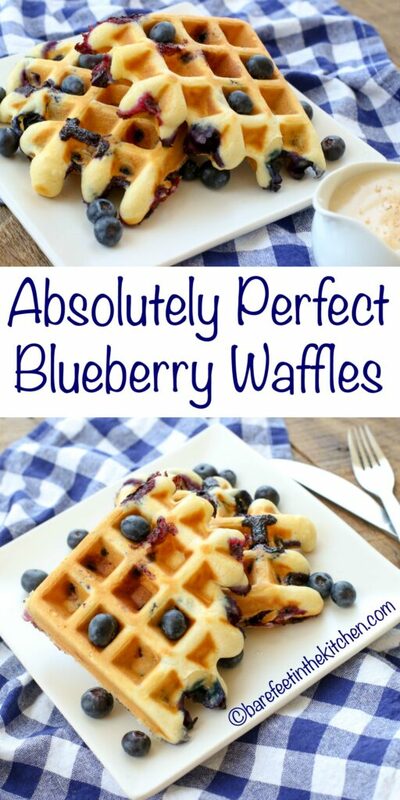 Oh my goodness, Blueberry Waffles are amazing. Bursting blueberries along with all those crispy waffle pockets to hold that sweet vanilla sauce? Yes, please! I’ve made these waffles so many times now, they have a place reserved now in my freezer alongside the Ham and Cheese Waffles that we all love so much. For more blueberry baking ideas, check out the Best Ever Blueberry Coffee Cake, Blueberry Coconut Banana Bread, Blueberry Breakfast Cake, and Blueberry Cookies. I adore blueberries in just about any form and each of this recipes is sure to be a hit! Blueberry waffles require a little extra effort to make sure they turn out perfectly and don’t trash your waffle iron. As some of the berries will burst while cooking, the potential for a sticky waffle iron is there. I recommend greasing the waffle iron generously with butter between each waffle or spraying with cooking spray. The following times when I made blueberry waffles, I used a damp rag to wipe it clean while it was still slightly warm. If anything sticks to it, a chopstick wrapped inside that damp rag provides enough pressure to remove any stuck on berries. Kitchen Tip: I use this square waffle iron or this round double waffle iron to make this recipe. 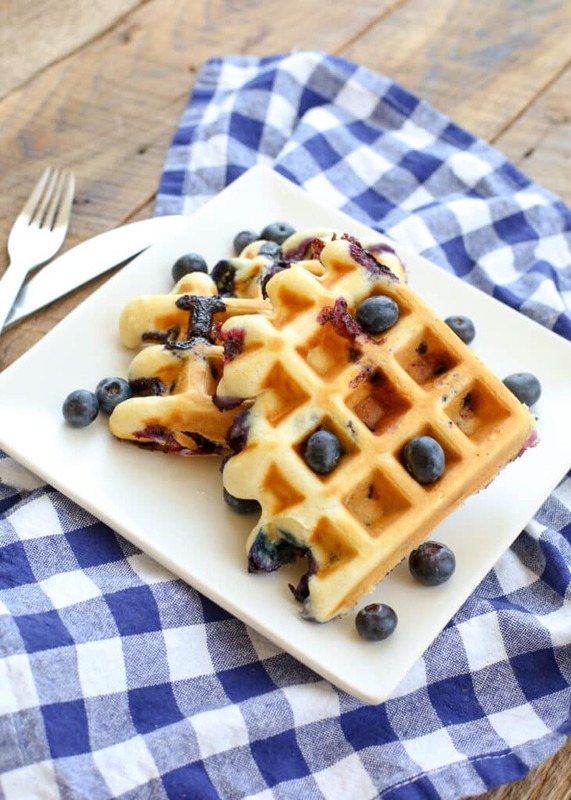 Crisp, fluffy waffles filled with sweet blueberries are the best way to start the day! Preheat the waffle iron. 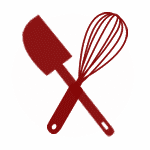 Stir together the flour, salt, baking powder, and sugar. Add the milk and eggs and stir to combine. Add the melted butter, vanilla, and almond extract. Stir to combine. 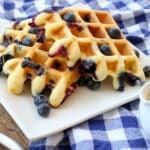 Stir in the blueberries and then pour onto the hot waffle iron. Cook until lightly browned. Serve with waffle sauce or with a drizzle of maple syrup. Enjoy! * GLUTEN FREE ALTERNATIVE: 1 1/3 cups brown rice flour, 2/3 cup tapioca starch, and 1/4 cup potato starch may be substituted for the all-purpose flour listed in the above ingredients. FREEZER MEAL: Let the waffles cool completely, before storing them in an airtight zip-close bag. Reheat the frozen waffles in a toaster oven or in the microwave. Made these today for my husband, myself, my mom, and my stepdad(who's VERY picky! ) and they were a HIT with everyone!! Thank you! All good, but I have to advise AGAINST using a non-stick cooking spray. I ended up ruining my perfectly good Cuisinart waffle maker by using spray (Which was actually recommended in the instructions!) Sprays contain soy lecithin. The lecithin turns into a gummy residue, which with repeated use will build a terrible layer of sticky gunk on the plates. When my maker was brand new, it worked great, no sticking. Then I started using spray (again, as recommended), and after a few batches I noticed the waffles were sticking a little, so I used more spray, etc. Eventually, I went on Google to try to find out why my waffles were sticking so badly. That's when I saw how many people were advising to NEVER use spray. There were several cleaning remedies offered, but most of them involved using ammonia, so I just chalked it up as a loss and bought a new one. I have never sprayed the new one, and it works fine. I use a waffle recipe that contains just a little melted butter, and that seems to be enough to make the waffles release with no trouble. I'm sure that brushing the plates with melted butter or canola oil would work also, but no spray! I'm trying to spread the word about not using the sprays on waffle makes, because I'd like to spare people the trouble and the ruined appliance that I went through. I've been using butter for mine and it's helped a LOT. I've been told that nonstick sprays on nonstick surfaces can be a mess. Thanks for the heads up! We have the non-stick green pan line from Williams Sonoma and it is stated in the manual to use butter, not non-stick spray so I just looked at my Krups waffle maker manual and it says to pre-season with non stick spray or oil. I'm going to brush with butter instead. It's worked well for our pans. Question - since the recipe makes 8 waffles, I'm guessing you divide the batter and pour that into the waffle maker for two 4-count batches. About how long do the waffles take to brown? They were great! I made them for my dad and he loved them! That's awesome, Paula! I'm glad you both enjoyed them. These waffles are all good. They keep well in the fridge and freezer. I send my extras to my grandkids for their breakfast the next day, but they don’t last that long. Microwave for 15 seconds and you have fluffy delicious waffles anytime. I'm thrilled that you like the waffles, Teresa!